It is two a.m. and dark outside. I watch heavy wet snowflakes gently floating down in the halo of a solitary street lamp behind the tinted glass window of our traditional ryokan style room. Unable to sleep, I get up and quietly push open the sliding door with the paper panels, trying not to wake up photographer Juha Laine, who is adjusting to the time difference better than me. I wander along the quiet dark corridors of the hotel. 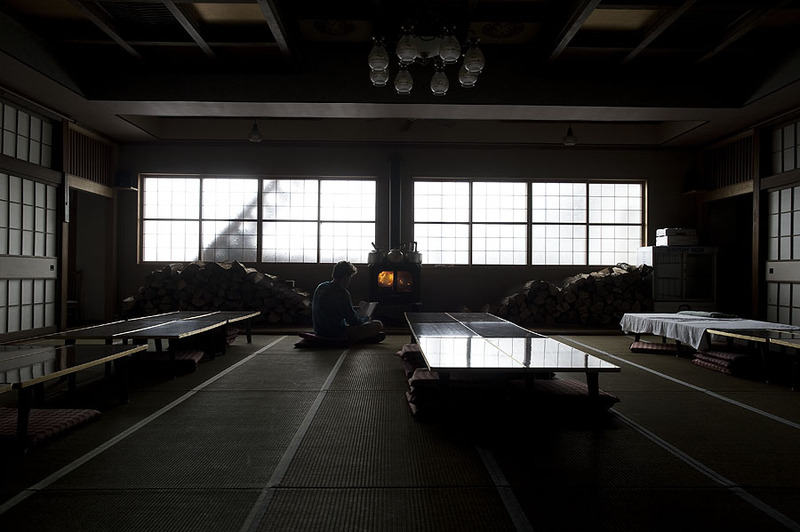 Downstairs I find a large empty tatami room where I reside by the warm glow of a cast-iron stove – the only light in the darkness of the room. I pick up my book to kill some time. In the book Snow Country by the nobel prize winner Yasunari Kawabata, the main character Shimamura travels by train from Tokyo to a rural onsen town in the mountains where he enjoys the solitude of the region and has a somewhat doomed love affair with a local Geisha. The area is depicted receiving heavy snowfalls lasting for days on end, that can sometimes cut off all the connections to the outside world and even trigger dangerous avalanches. We are in Nozawa Onsen, which situated in Nagano prefecture in the main island of Honshu is in the heart of Japanese Snow country. We wake up early the next morning, eager to see how much snow has accumulated in the mountains during the night. Carrying our skis through the narrow, maze-like streets of the village center, we see few other skiers. 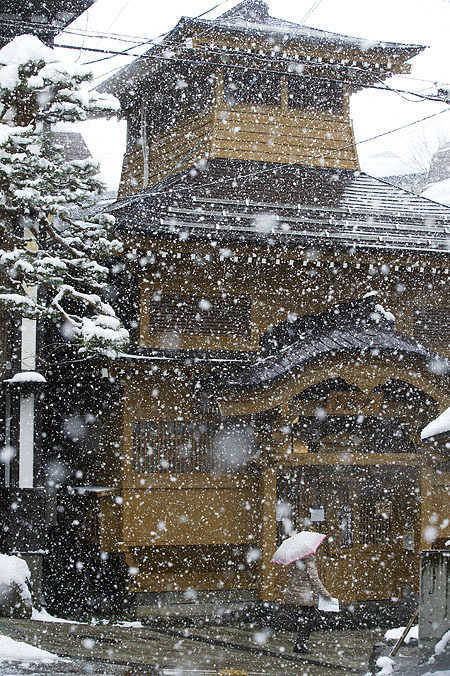 The ancient Japanese buildings, together with the smell of sulphur rising from the local bathhouses create a unique atmosphere rarely found in other ski resorts – even in Japan. Hey you, walking past the O-yu. 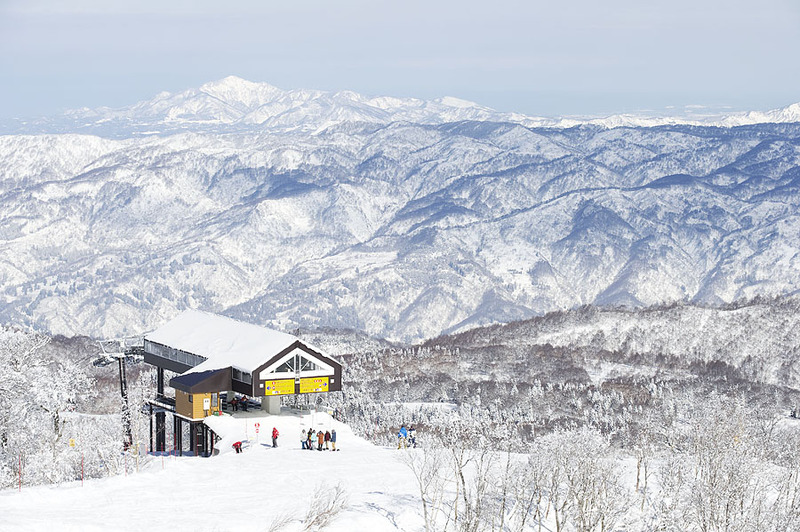 Nozawa is not your typical ski resort. 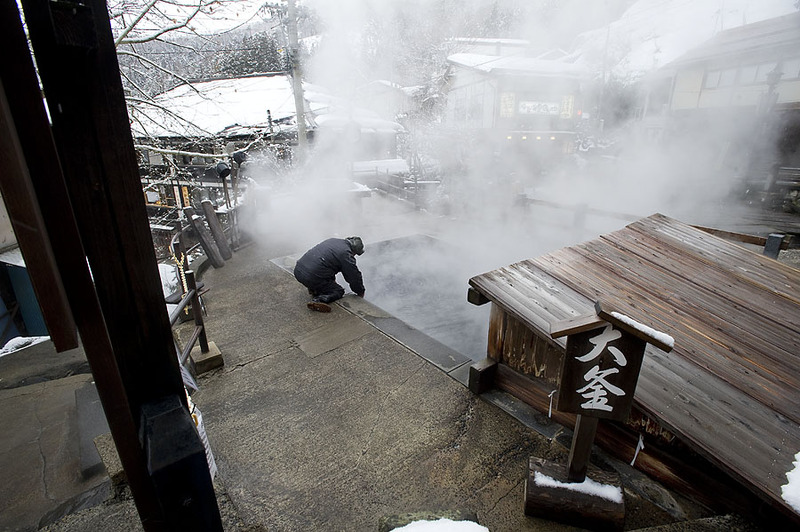 Although it is the birthplace of Japanese skiing dating back to just over 100 years, the area´s hot springs were believed to have been discovered already in 700 AD. Ever since, people have been coming here to enjoy the hot sulphurous waters, which are believed to have healing benefits for various illnesses. 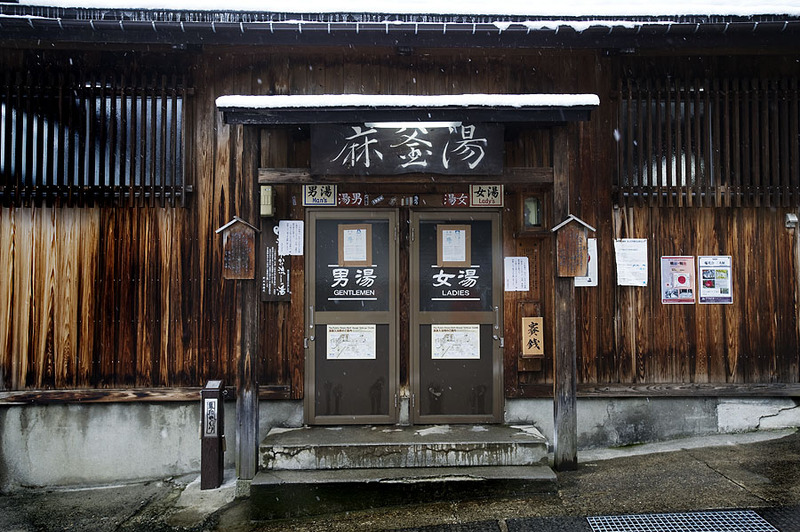 Today, alongside the private hotel-owned onsens, there are 13 communal bathhouses scattered around the village. Called Soto-yu, these beautiful historical bathhouses are free of charge and very popular after the ski day is finished. Having reached the ski area we take the Nagasaka gondola, which hoists us two thirds up the mountain. 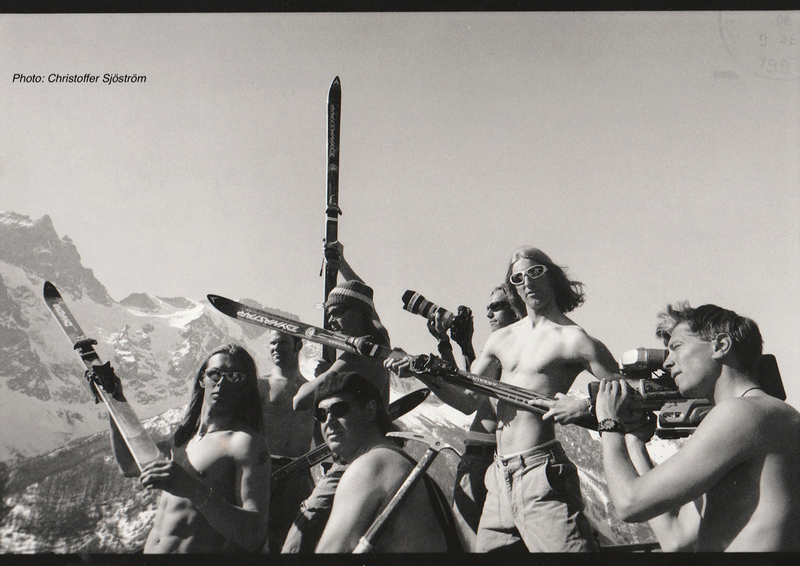 The extremely polite lift attendant welcomes us at the lift´s end station and hands me my skis. 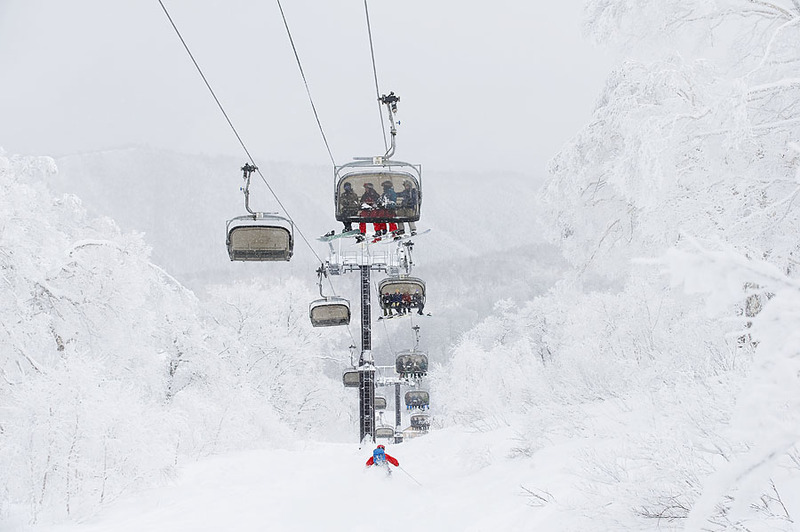 After a transfer lift, the Yamabiko chair takes us to the top of the mount Kenashi at 1650 meters. The view from the sunny top is nothing short of spectacular: 30 cm of fresh champagne powder is covering the forested slopes and you have a 180 degrees panoramic view of the Japanese Alps. With a little imagination, you can almost see the Sea of Japan, some 45 km to the west. On top of Mount Kenashi. 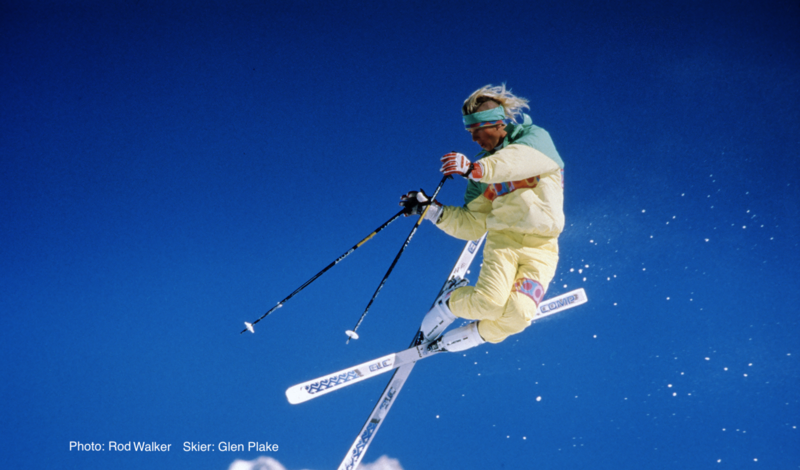 Skiing down, the crystal-like snow is incredibly light, making turning almost effortless. We first ski the untracked glades in the forests. After the glades have been skied out we try to navigate our way through bushes in the forest, that would on a normal snow year be all covered up by snow. According to the locals the snow depth in the area is the weakest in roughly 20 years, still with a little search there is some good skiing to be found off-piste and the slopes are in good condition. Moving on to the slopes, we quickly learn that the runs at the top and middle of the mountain tend to be on the easy side, while the slopes coming down in the village are steep and often covered with moguls towards the end of the ski day. This division makes Nozawa Onsen well-suited for all abilities. The steep mogul runs at the bottom of the ski hill really test your quad muscles and ski technique. It doesn´t surprise me when I discover later on, talking with Michiko Kono from the Nozawa Onsen Tourism Association, that the area has produced several Olympic athletes and world cup skiers. 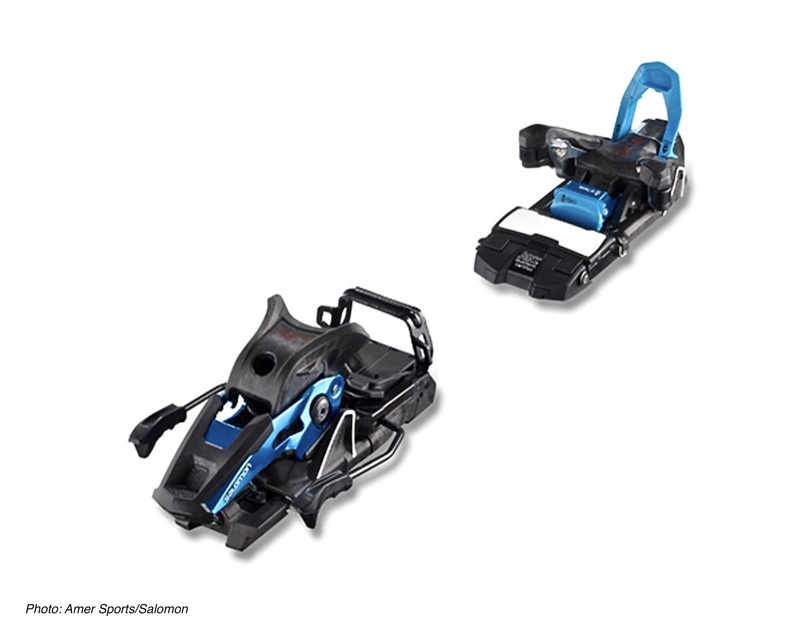 Luckily, if you run out muscle power at the end of the day, you can bypass the black runs, using instead the green runs zigzagging down on either side of the mountain. The Juzawa shrine, just off the main street. Walking back to the village after the day of skiing we marvel at the ancient Yuzawa Shinto shrine with it´s pagoda roof and the the beautifully-set Ogama hot spring, where in the piping hot 90 degrees water the villagers cook eggs known as Onsen tamago and vegetables, such as the local Nozawana, which is known throughout Japan as a pickled treat. You can easily try these delicacies at the market just next to the Ogama. On our way to our accommodation we stop by the St. Anton café on the main street of Oyu Dori and have steamed Oyaki buns, which are delicious, and judging by the queues also very popular. A local man doing some cooking in the Ogama hot spring. After leaving my ski equipment at the guesthouse I walk back to the village and head for an onsen bathhouse situated near the Japan ski museum in the outskirts of the village. 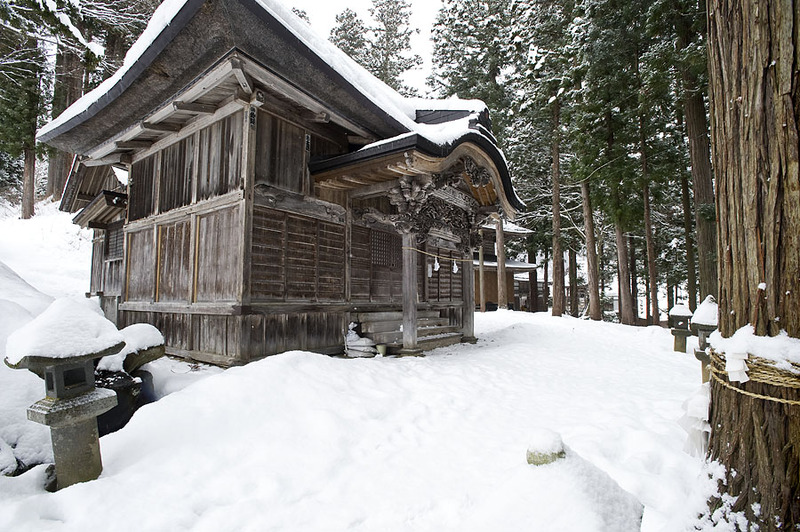 The small wooden bathhouse is weathered by time and has a humble appearance. I push the door open and enter. Inside a few bathers are soaking quietly in the bath under the main beam of the building in dim light. This is what real spas look like. Like in most of the historical Soto-yu´s, there is no changing room and after stripping myself naked in the hallway, I put my clothes on a shelf and walk towards the showers. I dip in the bath carefully, getting accustomed to the hot water. I am surrounded by five Japanese men of varying ages in a bath that couldn´t probably fit in comfortably too many more people. I strike up a conversation about the Japanese onsen culture with the white-bearded older gentleman facing me. His younger countrymen are quick to join in offering help with the English terms. The atmosphere is tranquil and the historical walls of the building create a cocoon-like space uninterrupted by the modern world outside. In an era of corporate ski area development Nozawa, an area steeped with history and culture, which hasn´t yet been over-developed, stands out. Mark Baum from Nozawa Holidays agrees: “It is a quiet farming town most of the time so we really appreciate people who visit and are mindful of the unique environment and customs.” When asked about the future development of his home resort, Baum has this to say: “I want it to keep its identity and be an environmentally sustainable traditional Japanese Village that happens to have some world class skiing.” I think it perfectly sums up our experience in Nozawa Onsen during our visit, and I hope it´s a vision that the locals will be able to realize. Like & Share if you dig. Get the latest stories first.